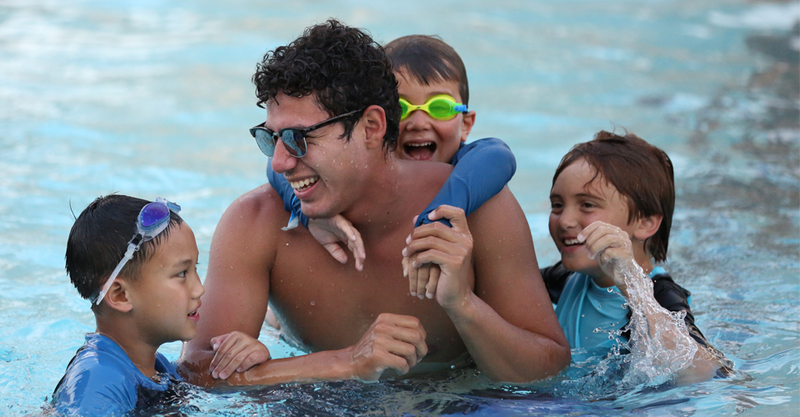 The City of Irvine’s Learn to Swim program offers lessons for all swimming abilities. Classes are available for infants through adults. View details about Learn to Swim levels here. Lessons are offered in two- or four-week sessions. Winter and spring session classes are offered Monday/Wednesday or Tuesday/Thursday for 25 or 40 minutes. Summer session classes are offered Monday through Thursday for 25 minutes or Monday/Wednesday or Tuesday/Thursday for 40 minutes. Duckling classes are two weeks on Monday/Wednesday or Tuesday/Thursday or four weeks on Saturdays for 25 minutes. Saturday session classes are 25 or 40 minutes for children, 40 minutes for adults. Spring Grid for Sessions 4 and 5: Registration for Irvine Residents, Sunday, March 10, 9 p.m.; Nonresidents, Monday, March 11, 9 p.m.
Summer Grid for Sessions 6, 7, and 8: Registration for Irvine Residents, Sunday, May 5, 9 p.m.; Nonresidents, Monday, May 6, 9 p.m.
Summer Grid for Sessions 9 and 10: Registration for Irvine Residents, Sunday, June 16, 9 p.m.; Nonresidents, Monday, June 17, 9 p.m.
All withdrawal requests must be received in writing at least 10 days before the first day of the session and are subject to a $5 processing fee per participant, per class. Withdrawals/refunds are not available once the session begins. All sessions begin on Monday. Requests received less than 10 days prior will be processed for 50% of the fees. Withdrawals/refunds are not available once the session begins. Sorry, there are no make-ups or credits for missed classes. For classes withdrawn less than 10 days prior to the start of the session, you will be charged 50% and the money will be placed on your account with the City of Irvine. You will be charged an additional $5 if you would like your refund via credit card or check. Due to the volume of swim lesson participants, if you are enrolled in a class you will not be called from a waitlist for the same session. Parking in front of the Aquatics Center is limited. Please use the high school lot on Escolar or the Heritage Park lot off Yale.